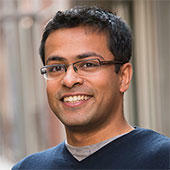 As a design manager, Vignesh strives to provide design leadership throughout the process of building a product. He is passionate about every aspect of the user’s end-to-end experience, knowing that the product experience starts as early as the marketing page on which the user learns about the product, not just when the user first launches the product. Vignesh believes that great design happens when there is balance between empathy and the use of scientific methods during the design process. He holds a Master of Science in Human Computer Interaction from Indiana University. Connect with Vignesh on LinkedIn.